64 • June 2018 • S I G N & D I G I T A L G R A P H I C S SPECIALTY IMAGING DIGITAL GRAPHICS Most sign shops buy the material in rolls. For car signage, the material must be 30 millimeters thick so that it will have enough strength to stay on a mov- ing vehicle. Everything else uses 20-mil- limeter thick material. 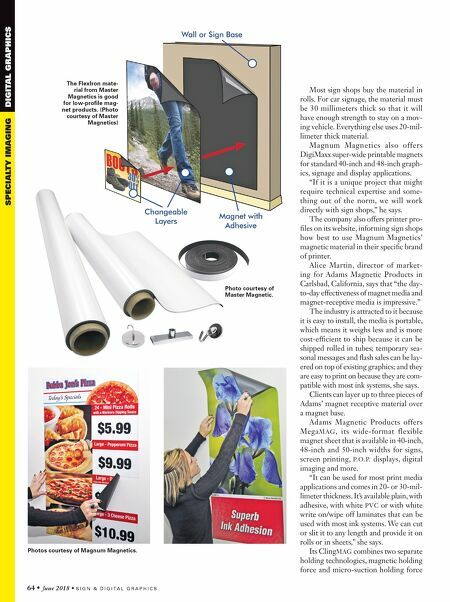 Magnum Magnetics also offers DigiMaxx super-wide printable magnets for standard 40-inch and 48-inch graph- ics, signage and display applications. "If it is a unique project that might require technical expertise and some- thing out of the norm, we will work directly with sign shops," he says. The company also offers printer pro- files on its website, informing sign shops how best to use Magnum Magnetics' magnetic material in their specific brand of printer. 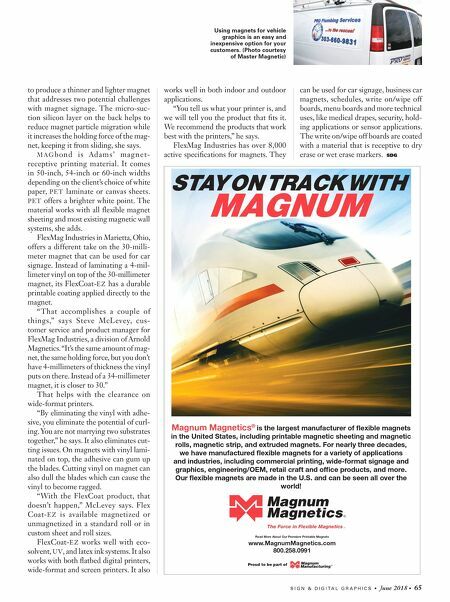 Alice Martin, director of market- ing for Adams Magnetic Products in Carlsbad, California, says that "the day- to-day effectiveness of magnet media and magnet-receptive media is impressive." The industry is attracted to it because it is easy to install, the media is portable, which means it weighs less and is more cost-efficient to ship because it can be shipped rolled in tubes; temporary sea- sonal messages and flash sales can be lay- ered on top of existing graphics; and they are easy to print on because they are com- patible with most ink systems, she says. Clients can layer up to three pieces of Adams' magnet receptive material over a magnet base. Adams Magnetic Products offers Mega M AG , its wide-format flexible magnet sheet that is available in 40-inch, 48-inch and 50-inch widths for signs, screen printing, P.O.P. displays, digital imaging and more. "It can be used for most print media applications and comes in 20- or 30-mil- limeter thickness. It's available plain, with adhesive, with white PVC or with white write on/wipe off laminates that can be used with most ink systems. We can cut or slit it to any length and provide it on rolls or in sheets," she says. Its ClingMAG combines two separate holding technologies, magnetic holding force and micro-suction holding force The FlexIron mate- rial from Master Magnetics is good for low-profile mag- net products. (Photo courtesy of Master Magnetics) Photo courtesy of Master Magnetic. Photos courtesy of Magnum Magnetics.